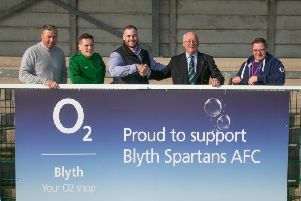 Blyth Spartans manager Alun Armstrong did not hold back when speaking to the club’s official website after Tuesday night’s 2-1 defeat at the hands of Bradford (Park Avenue). Spartans fell behind after Jake Beesley – on loan from Salford City – beat the offside trap with relative ease before rounding Pete Jameson – midway through the first half. “The first half was disgusting, we went through them at half-time as the performance was unacceptable. “At the moment, we seem to be a little bit fragile and lack match fitness, we’ve worked them hard in pre-season but players have been missing for one reason or another and we haven’t been able to gel as I would have liked. We’ve also brought in a few players late in the day, which isn’t ideal." And the former Ipswich Town and Middlesbrough striker had a stern warning for his players. As poor as Spartans were in the first half, Armstrong was impressed with the second-half display and feels Spartans should have taken something from the game. “We were really good in the second half, Jamie Holmes was exceptional after the break – we gave the lads a good rollocking and it did the trick, maybe that’s something we’ll have to do more of to get the guys to play. Dan Maguire missed a couple of golden opportunities to score in the first half, but Armstrong isn’t too worried about his strikers lack of goals. “Nipa takes a while to get going, he always has, he’s snatching at his shots at the moment, but he’s not fully fit, we’ll be fine when he gets his fitness back to where it needs to be,” he said. “There is a chance we’ll give Brad (Fewster) a chance, but Nipa needs to play games to get his fitness up, it’s a catch 22 really.